Anyone who has seen Steve Roach perform live knows that his music has a unique power to inspire and engage the listener. On This Planet was carved from Steve’s “on-the-fly” live experiences, refined in the studio with the same intensity of the original performances: atmospheric washes of dark synthesis with an array of tribal percussion mixed into a 3D sound space, transporting you to uncharted terrains, all inside the expanse of your own mind. This awesome followup to THE MAGNIFICENT VOID by dark ambient soundscape explorer STEVE ROACH opens with a massive thunderclap… and then gets intense! ON THIS PLANET is a new category of live recording — a "studio re-creation of the live experience." Roach spent over a year creating the elements of his epic two hour live show, then refined the best material to fit this brim-full CD. On this planet, the ancient overtones run deep. Rattles, didgeridoos, clay pots, rocks, and log drums share the stage with synthesizers, samplers, and a host of high-tech digital effects. MUCH more rhythmic and powerful than previous recordings, ON THIS PLANET is a ritualistic journey that’s positively electric with the on-the-edge energy of the live moment. 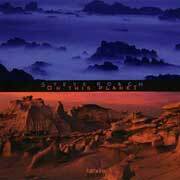 This "Studio CD Concert" brings the dark thunder of a Steve Roach performance into your own space. ON THIS PLANET was carved from the live experience. Every concert I played over the last year provided a testing ground for the sonic topography I was exploring and refining. There were moments when the spontaneous inspiration of the setting brought new compositions into form. A Darker Star was such a piece, recorded live as it is heard with a few brush strokes added later. Most of the material, however, was perfected in the Timeroom soon after returning from various performances or just before packing up to leave. Rather than assemble a collection of concert excerpts, my aim was to absorb the on-the-edge atmosphere, take what I considered the peak moments and most profound musical discoveries, steep myself in the feelings and shape them over time. Since I began presenting my music live nearly 20 years ago, I’ve been striving to capture the intensity unleashed when the honesty of putting oneself out in front of an audience is pursued. I encourage listeners to travel the terrain I’ve mapped ON THIS PLANET at the volume level of its creation. Turn it up, feel it in your bones!